The remote town of Izumo, 33km west of Matsue, is home to Japan's oldest and largest Shinto shrine, Izumo Taisha - although it only comes second in importance after Ise Jingu. 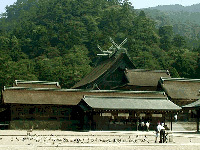 The shrine was established in times immemorial, however the present buildings are fairly recent, due to the numerous reconstruction. According to the Kojiki (the Legendary Stories of Old Japan) and Nihon Shoki (Chronicles of Japan), the main hall was 50m high, the largest wooden structure in the country, surpassing Nara's Tōdai-ji Temple. The scale of the shrine was first reduced around 1200 CE. The main shrine was last reconstructed in 1744, and is 25 metre tall. The other important building were rebuilt in 1874. 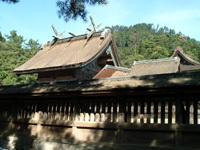 Izumo Taisha is dedicated to kami Okuninushi-no-Mikoto, patron deity of the wedlock. The legend has it that Susa-no-o was banned from heaven by Amaterasu Omikami, and went to live with humans in Izumo. Susano-o earned respect from the local people by slaying a giant, eight-headed serpent that was menacing the town. He married with a local princess, and had many descendants, including Okuninushi. 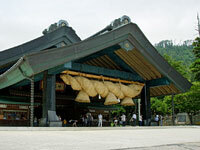 Nowadays, couples come to Izumo Taisha to ask Okuninushi for love and happiness in their marriage. They summon the deity by clapping four times their hands, instead of the usual two times, twice for themselves and twice for their partner. 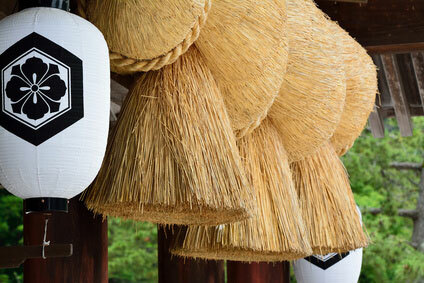 It is said that every November the 8 million kami from all Japan gather at Izumo Taisha for a week. This period is known as kami-arizuki (神有り月　or "month of the gods") at Izumo, and kannazuki (神無月 or "month without gods") in all other parts of Japan. Izumo is easily accesible from Matsue (20min, ￥570) witth the JR Limited Express Super Matsuekaze (ordinary trains take 45min). Coming from Osaka or Fukuoka/Hakata by shinkansen, change at Okayama for the JR Limited Express Super Yakumo, which takes 2h50min (￥3,890). The two nearest airports are Izumo (25min, ￥670) and Yonago (45min by bus from Matsue, ￥960). JAL flies to/from Izumo and Sapporo (Chitose), Tokyo (Haneda), Osaka (Itami), Oki and Fukuoka. ANA has flights between Yonago and Tokyo (Haneda) and Nagoya (Chuubu).